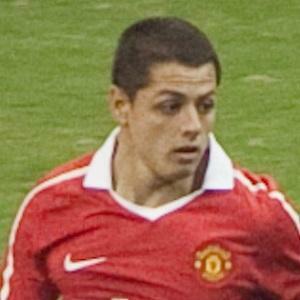 Striker also known as Chicharito, who became the first Mexican player to join Manchester United in 2010. He would later join West Ham United F.C. in 2017. He debuted for the Mexican national team in 2009 and became one of the all-time leading international scorers for his country. He began his professional youth career at the age of 15 with C.D. Guadalajara. He was the top scorer with 7 goals at the 2011 CONCACAF Gold Cup, and was named MVP of the tournament. His father, Javier Hernández Gutierrez, was a Mexican international striker. He has been dating Instagrammer Sarah Kohan since 2018. He and Sarah are currently expecting their first child together. In 2010, he made his Premier League debut when he stepped in for Wayne Rooney during a match against Newcastle United.